A short time ago, I received an e-mail from a family member. For the sake of family harmony, I must add that the relative is on my side. I'll call him "Dave". The email was a forwarded screed written against a faith–not, needless to say, Dave's. I was disgusted and astonished he'd endorse what I considered hate literature. He had also sent it to friends, as well as his wife and adult children. My response was to ask him to also send the message to his friends of that faith, and I'd do the same, and see what they thought of its "truth". The upshot was a terse e-mail from Dave: "Stick with your friends; sorry for the exchange". I received a series of e-mails and links from my friend, countering some of the distortions. He wondered why Dave felt as he did, asking, "Has Dave had any difficult or hostile encounters with (us)?" Though I haven't see Dave for years, I'd guess not. He likely has no friends of that faith, either– which I admit I figured. I was making a point: how easy it is to hold enemy images when we know not a single one of "them". I'm not naive to the deep conflicts of the world, especially those with religious agendas. But the e-mail was not focused on the extremist element, it was, at its conclusion, a diatribe against all of "them". I sat up late into the night ranting to myself. But Dave had sent me a gift wrapped in that disturbing message: the opportunity to examine my own prejudice. Have you ever played the Stereotyping Game, where someone identifies a group (blondes, Slavs, poodles, architects) and you complete the sentence "All ... are..."? I used it in a social psychology class I taught; it elicited whoops of embarrassed laughter but led to intense discussion: What is bigotry; what is conviction? How do we know "what 'they' are like? How easily those stereotypes came to mind, how readily we seek confirmation and reject contrary evidence. We become dumber, less responsive to complex problems and dilemmas. It's a seductive form of stupidity. I began to view Dave through the lenses of various stereotypes: his nationality, age, profession, class. In a matter of hours, Dave had passed from kindly, distant relative to major jerk. The rift opened to an uncrossable chasm. I decided, Done with him. After a night's sleep I had another thought: Oh no. I have to keep talking to him. Ignoring him is a form of apathy, even cowardice. I recalled a version–several have been used at various sites–of a well-known statement (often presented as a poem) by the Protestant minister, Martin Niemöller, ca. 1946. His words reminded me, as they have many, that silence is nearly always interpreted as assent. I saw a pinterest entry that said Jesus hates Islam. There were other entries slamming that religion. But I don't remember reading that Jesus hates. At all. Still I do try to stay away from toxic people. To me, that includes those who hate. Something I will not allow my journalism students to do is generalize....there is no ALL to anything...not even ALL PEOPLE LIKE ICE CREAM..though hard to believe that is not true! Generalizations are misinformation, propaganda, and deadly! We all deal with shades of bigotry and sometimes don't realize it. Stereotyping is one shade- it sometimes appears benign-"She talks with her hands. She's Italian." But then there is the bigot whose comments make us flinch or provoke anger. I hate myself when I don't speak up and counter this type of bigotry. I shy away from confrontation usually, but the poem reminded me of what silence can do. I deal with a relative whose bigotry has caused a serious rift. I can't be around him because almost every conversation contains a bigoted, hateful comment. Sad. Bigotry grows out of fear and out of ignorance. We all are guilty of stereotyping for sure. As long as we think"them" as different from "us", we will feel threatened. The "nicest" of people make some bigoted remarks. With those that we deal with every day, it suffices to point out that what they have just said is not based on critical thinking. Do you remember "Archie Bunker"? Not an evil person but an ignorant one. It is really important to teach young people to be aware of their biases and to examine them. Every time someone says something like this, even just in ignorance, I let them know it's not OK. I used to keep quieter, now I speak up. Even to kids on the street. It really hits home when you bring people into your family who belong to groups that get targeted. Yes, a very familiar quote but remember, that the "they" Pastor Niemoller was speaking of was the government. I'm more afraid of the people who would try to stop Dave from sending his offensive email than I am of Dave. You might want to read Bonhoeffer: Pastor, Martyr, Prophet, Spy by Eric Metaxas. Wonderful book about another heroic (and I don't use that word lightly) Lutheran Pastor who ultimately was executed by the Third Reich for his unyielding defense of free speech. The constant need to educate does wear on one, but it's important to keep the lines clearly demarcated. Best if we can do it in a way that keeps the dialogue open, but sometimes the best we can do is articulate the line and walk away. I worked with a student the other day, and spent 20 minutes explaining to her that she must do more research, that it was NOT okay to argue that Harriet Beecher Stowe's book was too incendiary and that a war shouldn't have been fought because after all, the student argued, slavery appeared not to have been all that bad. (yep. really. she took that position) I ended up telling her that the paper she was writing (for a history course, no less!) was 1) not going to be academically tenable and 2) morally repugnant. I realized later that this may have had less impact than I'd hoped, given that she may not actually have recognized the word, but still. . . There is sometimes a point where people are just not open and/or ready to be educated, but they need to know that others Will not accept what they're saying. All around us angry outbursts, diatribes, hatefulness seem to be increasing. I believe that the cathartic rush experienced while expressing anger can become physically addictive, especially for people who (like your relative, I suspect) feel deeply insecure in themselves. I wonder whether Dave's message was about a firmly held position, or the thrill of denouncing? In my experience, the bigotry of people like Dave is fed by indignant opposition, but falls apart when met by empathy and kindness. I grow increasingly intolerant of intolerance. You made a wise decision and I'm inspired to do the same. I couldn't agree with you more, and yet I don't think all ideologies/religions are beyond criticism, e.g., the Peoples Temple founded by Jim Jones. It gets complicated trying to enumerate the characteristics legitimate faiths have in common, but I think it's important to make the distinction, because not making it just gives haters more ammunition. All I can tell you is brother you have to wait". I am surprised that Pinterest does not moderate such comments. Pam: I agree and that's why I suggested he contact his friends among that group. It's much harder to generalize when you live in a diverse setting. Kristien62: I so hope we all speak up. Sometimes we even stereotype ourselves: "I'm Italian so I talk with my hands." It can be an unconsciously learned pattern. Madame: Agree it is not based on critical thinking, and sometimes they do think critically- but have chosen a very selective exposure to what they read or listen to. LPC: I once married a man whose family was opposed to my religion. They were essentially really good people operating in an inherited belief system. They actually liked me and did that by ignoring my background. I got a first hand view of prejudice's deep roots. "In twenty years there will be enough (of them) in the US to elect the President. Be warned and act accordingly." Chilling. materfamilias: I find that younger (and even some older Canadians) Canadians do not fully 'get' the impact of slavery and its aftermath in the US, since it is not directly part of Canadian culture. I would like to ask her how she would like to be taken,sold, shipped from her homeland and enslaved for life. Not that bad, eh? C.: Dave is not usually exposed to diverse cultures, which makes him vulnerable to such material. Empathy certainly reduces bigotry by meeting the fear in someone with understanding. L'age: Now let's see if I can stick with it! Susan Partian: I decided not to link to the actual text; anyone who wants to see it can contact me. The e-mail is not a criticism of the practices of a cult but of an entire religion, and all its practitioners. There are some really warped groups out there, some operating under the guise of "religion" and I agree we must speak out about those too. Your suggestion that Pinterest should "moderate" a particular comment because you are offended is frightening. The comment offends me too but that person has a perfect right to express him/herself no matter how offended you & I may be. Likewise, we're free to argue our side but not to censor. Next time it may be you who's labeled as offensive. Free speech is the cornerstone of a free society & should never be limited by one person's idea of what's right or wrong. Welcome to my world. My 73 year old mother's favorite topic is how "those people" [meaning - anyone not exactly like her, with her beliefs and views, and especially anyone of another color, race or religion with an accent] are ruining "our beautiful US of A." She absolutely loathes my, and my husband's, belief systems, philosophies, political orientations and deepest held beliefs. This is nothing new, she was always angry and critical but became more hateful with age, just as her father did. Her mother wasn't like this, my own father isn't like this (and, poor man, I can only imagine how much bigoted ranting he's subjected to on a daily basis). I'm mortified. Not only is my sweet husband in about 3 categories she hates, but I am too (no surprise) and all of my closest friends have at least one terrible "flaw" to her. So I have to keep my family quarantined from the rest of my life since I'm used to deranged behavior but others should not have to be wounded by it. Family, where the genetic lottery hands you a surprise in every box. M: Many sites distinguish between freedom of speech and the dissemination of hate literature and consequently do not give people "the perfect right" to express themselves. Here, the Canadian Human Rights Act prohibits the posting of hateful or contemptuous messages on the internet. I did not publish the content of that e-mail for that reason, and also because I find it deliberate misinformation. It's interesting, though, how easy it is to stereotype. My husband and I are of different racial and ethnic backgrounds. On a couple of occasions in our 35+ year marriage he has said something to the effect of "that was a racist comment you just made". My initial reaction was to get defensive and point out that I was subject to a lot more racist comments/aattitudes when we got married than he was, but then I realized that he is right: I have lumped all members of the group in one category. He didn't say I was a racist; he said I made a racist comment. I'm not a bad person; I just have to watch that I don't generalize. Anonymous: So much pain and fear under that (I will assume you know all about projection.) And what a price paid in diminished love. I guess quarantine is the logical strategy. What happens with aging? Dave is 80 and was not always like this. So sometimes when I say something and then am asked "Did you just realize you said..." that's been illuminating. Like you, initially defensive but then, more awake. Duchesse, I think about the projection (I'm the Anon with the "racist Mum") all of the time. Her family hasn't been successful at love and creating good families for at least 3 generations before her, so if I wanted to solve her problems (which I don't, as openness on my part just brings more exhortations to ditch my husband and marry a surgeon, or unkind comments about their financial investment in me not paying out well enough), I could not. Too many angry, unkind, excluding people have already gotten this ball rolling for one person to stop. Better to let the family die out entirely and be done with it. I have heard that many elderly become more extreme, maybe hateful to others, maybe abusive to family, as pain, fear of losing control, and fear of death close in. Also as medical conditions erode their minds and sanity. Very sad situation. We spent time talking about a new documentary about Hannah Arendt and 1930s Germany. And as I grew up in Miami, that led us to talking not only about the Holocaust but also about Cuba and how some Miami folks viewed the influx of Cubans in those days. I take it Section 13 hasn't been repealed yet. That's unfortunate. Anon@4:28: I wish we could talk. Given the limitations of a blog, only will say that I wish you continued strength within this painful protracted situation. Looks like you are breaking the pattern. Jean S.: The more talking, the better, even as we struggle with how to reconcile the value of free speech with the malevolence of defamation. While I find Whatcott's flyers repulsive I still maintain he has the right to say what he thinks. That's the essence of free speech. I think many of us are dealing with this sort of thing lately. Undoubtedly the internet is a factor, since it's easier to spread the hateful nonsense, and where you might not have known about Dave's views before, now it's very easy for him to share them (sadly). I am a white Christian (culturally, at least). Where I grew up, in a Detroit suburb, we were literally all the same. In my high school of some 2,000 students, there were no blacks, one Japanese kid, and one Jew, that I knew of. I first met a black person in college. I think I'm pretty open-minded, but I'm aware of holding some stereotypes and prejudices deep down. But I am more unbiased than my parents, and WAY more than my grandparents. I'm glad that my kids have a different experience. Despite the stereotype (!) people have about Texas, in our suburban Houston neighborhood, my daughter goes to high school with, and is friends with, Muslim kids from Pakistan, Hindu kids from India, a Bosnian Muslim girl, several kids from Africa, a boy from Argentina, and plenty of white Christian Texan types. She's much better prepared to deal with the real world than many of us, especially people like your relative. The "other" doesn't have much meaning for her. One of my most exciting insights was bringing to consciousness my own racism. How deluded I had been about my deeply held liberal beliefs! Afterward there was the teeter-totter between shame and joy at the discovery. That enlightening realization now works like a GPS whenever I wobble in the direction of self-righteousness on one hand and self-deceit on the other. Jill Ann: The diversity your daughter has at school reduces prejudice; I, like you grew up in Michigan (Petoskey) with little exposure to any groups other than white people and native Americans. But I believe even more important is the families' attitude, transmitted by daily remarks and behaviour. diverchic: To immediately observe my thoughts has been an important step. It was also a big wake up to be (as one of the dominant group) suddenly on the receiving end of prejudice, to feel its sting and the frustration of not being seen or respected. From my experience, hate is often accompanied by a great deal of anger. Sometimes it is easy to determine what that anger is about, sometimes not. However, usually it concerns discontent about life, either general or diffuse. Recently, one of my old friends from high school was ranting about the Oscars (of all things) on FB. He claimed that "the Oscars" were trying to push "their morality", "their values" on the rest of us. I found his whole screed to be bizarre. All I could see was anger. And I agree that generalization is not ever a good analytic tool. As a Texan, I have borne the brunt of some real stereotyping about Texans! Yes, it is offensive to be thrown into the same barrel with others who have their own set of views which are not your own. I agree that dialog should not be cut off with those who hate, but it is sometimes challenging to find a productive avenue for that dialog. Sometimes it is best to just ask questions to try and determine the source of the hate and anger. Correction: I should have written that their discontent is either particular or diffuse. Susan: Over the years I've found nothing as effective as Dr Marshall Rosenberg's process, called Nonviolent Communication, for listening behind someone's anger to hear their needs or desires. There is more to it than I'm noting here, and it is used worldwide in peacemaking, whether within, between persons or institutions. See www.cnvc.org if interested. Because a branch of my family is Texan I'm aware of the stereotypes. They occasionally 'play the role': "Whhhat, you call that a big steak? I'm from Texas, that's a meatball." Prejudice. The very definition says it all, to pre-judge, without knowledge, thought or reason. Have we all done it at one time or another? Most likely. Is is wrong or unfair? Most definately. This topic leaves me wanting to try harder to look beyond the surface. Very thought provoking. Thanks Duchesse. Anonymous@6:08: The e-mail contained not one word from Dave personally, unless you count his entry of my address. It was forwarded e-mail from someone he knows, apparently. If Dave himself had something to say, that would be different. I am so proud of you, speaking back, and also, reaching out to friends of that faith to get their opinion. Trapped for a night in Denver due to weather last weekend, I grabbed dinner in the bar of a diner. While waiting for my food, a man struck up a conversation....and preceded to berate and bevile blacks, Muslims, welfare and union recipients, people suing doctors, and I canot remember what else. The man works as a security contractor for the US State Dept. what a travesty of diplomacy. I could not wolf down my dinner fast enough to race away, and I am ashamed I didn't take him on. I rationalized I was far from home, and had he followed me outside in the snow, I could have been hurt. And yet. My Master's thesis was on moral choice of citizens to act against their government (in Denmark and France during WWII, in the US against forced deportations in the 1980s against central Americans), I work for the government and thus was one of those he was eviscerating. It will be a long time before I feel clean again, both for his hatred, and for my silence. Gretchen: Strange town, strange man, and alone- I would have done exactly the same thing. In that situation, personal safety overrides any impulse to try to engage in a discussion that will challenge core values. In my case, I might not responded to Dave if he had not cc'd family. It takes energy and a skill to address fear, even when it is founded on fact. Addressing fear built on lies is even more work. If you were ready to eliminate Dave from your life because of the email he forwarded, it appears you attributed some aspect of it to him, whether or not he wrote it. My point is, if we cannot discuss negatives without it automatically being labelled "hate speech," no real conversation is possible. It would be useful to know why Dave forwarded the email, what part of it he thought true, if any, and why. It would also be useful if your friend was able to acknowledge negative aspects of his religion or its practitioners and how they might affect non-practitioners, rather than treating any criticism as "misperception." Absolutist thinking contributes little to understanding and working out differences. Just my opinion. Sounds like you would like me to pay attention to negative remarks from persons who chose to (anonymously) represent persons of another faith as horrible people, to find a "kernel of truth". I read widely, seeking both sides of issues, but consider whether a piece is fact-based, or, if someone's opinion, presented as such. The fear of critical thought seems to me to be at the root of much evil in this world, and it seems clear that the kind of bigotry you describe reflects exactly that fear. I applaud your choice not to simply stop talking to "Dave," as I am in a similar position. I recently had conversations (one email, one in person) with two family members who quite simply had their minds made up and refused to be confused by facts. One had passed along an untrue story about something a celebrity was supposed to have done about 40 years ago, and when I offered a wide variety of documentation, including testimony from the actual individuals involved, discounting this as unfactual, he told me that his grandpa (who, of course, hadn't been involved) had told him it was true. Another family member condemned the use of a kind of cleanser because it contained all sorts of "poisons" - when we brought out the cleanser in question and looked at the ingredients, she just said that she could find discussions on the internet saying that they were bad for you, and she would not change her mind. Both of these people are afraid of something, but I'm not sure what. I see it as my job to simply plant the seed of reason/doubt, and it will either grow or it won't. Silence is not an option. Bad thinking (meaning irrationality masquerading as careful thought) must be noted, but gently - so as not to disturb the seed from possible growth. Marsha: The interactions you describe bring out the absolute worst in me! I have a tendency to tell someone like that (after presenting evidence) that he has his head up his behind. Of course I've had mine there, too, which is why I recognize it. Your ability to deliver the message gently is inspiring and I hope it does get them to think. You said In your original post that after sleeping on it you should keep talking to Dave. You even entitled the post " Can I learn something from hate mail" and said you saw this as "an opportunity to examine your own prejudice. "Now your reply to anon @9:24 seems to indicate that you have no intention of "paying attention" to Dave and you don't need to have that conversation. What made you change your mind? "Sounds like you would like me to pay attention to negative remarks from persons who chose to (anonymously) represent persons of another faith as horrible people, to find a "kernel of truth". "The e-mail was a forwarded screed written against a faith"
This does not indicate the writer was anonymous, nor does it state that s/he specifically described religious practitioners in any way, so I have not rendered an opinion on those issues. My only point is that there is often more than one truth to be considered. However, I can answer your question "Can I learn something from hate speech?" The answer is no; once you have characterized speech as hate, you do not appear to be capable of sufficient dispassion to analyze its content. The answer may be different for someone else, of course. M: I stand by what I wrote: that initially I was done with him and now realize it is important to keep talking to him. Your conclusion is erroneous. It's not *Dave* I'm "not paying attention to", it's the defamation and and bigotry of the forwarded e-mail. I did learn something from it, as I said: an opportunity to examine my own prejudice. First, a "screed against a faith" is pretty likely to include its practitioners, wouldn't you say? Second, there is indeed "more than one truth to be considered"; however, when an e-mail characterizes *any* group via sweeping generalization, in defamatory language, I don't give it the credibiity I'd accord a thoughtful, fact-based, thorough treatise written by an identifiable source. Now I am mulling why comments like yours are always anonymous. Why would you say that is? Duchesse, this is quite a thread of conversation. I like that people are challenged by this topic, but I am also a bit confused. Haters tend to hate, philosophers tend to want to get to the seed of the discussion, and some people just want to make it all stop. I made a decision a few years ago not to ever live in anything but a "blue" state, and to never date anyone who wasn't at least an independent. Too much work to try to find middle ground when there are too many other things to debate (tea? coffee? Sleep in or not? See everything on vacation or lie around and read?). Does that make me narrow minded? No, I would hope not. I would like to try to understand why haters feel the way they do, and why some folks, on any issue, feel they need to educate others instead of accept that the differences exist. But I, for one, am exhausted by it all. Especially here in the U.S., but it could very well be endemic everywhere, without my residence and first-hand recent knowledge of other lands. Gretchen: I have learned yet another thing from this thread: clear statements are often interpreted as the reader wishes. I stand by what I wrote and-though hate e-mails are rampant- feel parsing them for kernel of truth is not the best use of my time. M: Do you know the term "concern troll"? That is why your comment was deleted. No what's a concern troll? It doesn't sound good. "Now I am mulling why comments like yours are always anonymous. Why would you say that is?" I perceived the title of your post to be an invitation to philosophical discussion, but I now see you were just seeking validation of your outrage. That's fine, just something that doesn't particularly interest me, so I'll move on. Sorry to have disturbed you. Terry P: It does not feel much like "a philosophical debate" when someone addresses me, from the first sentence, with "Your complete dismissal of everything Dave has to say...". That is a tone of blame, not of debate. Your excuse of computer illiteracy is a little dubious in 2013. You *did*, however, get one of your judgments right: hate mail outrages me. But you missed my key point: I decided to keep talking to Dave. It is much easier to label opinions than our own as hate speech, especially when it is something we do not agree with; by labeling something hate, there is almost no more opportunity of discussion foreward, because how can you have a discussion when you think the other is only "hating"? Having a teenage son with an active mind, I am constantly reminded that we as a human society, will always disagree about something, that will not end. Otherwise it will be way too boring, when we all agree with each other. My son does not have to agree with me at all, he has the freedom to choose. Opionions are just opinions. It is different when the person "Dave" is actually making law that is based on his opinions and forces everyone else to obey, that will be come dangerous. I really do not think that is what you are talking about here. When others' opinins become hate speech automatically when it is different from yours or mine, it does point out some underlying hypocrisy. Anon@12:54: I gather that you have the concern that once something is termed "hate speech", there is no opportunity of discussion with its author or disseminators. I disagree with you, but when a message is drenched in such vile terms, it does make me less willing to enter into discussion. However, I would enter into one. Anonymous authors of hate e-mails are generally not looking for discussion, though- or they would not hide behind anonymnity. They want to sensationalize, scare and vent their bile. I read the entire e-mail more than once, and considered its arguments. I consulted members of that faith, looking for more learned input concerning certain sections attributed (inaccurately, as it turned out) to "scripture". In other words, I gave this e-mail some time, though it does disgust me. 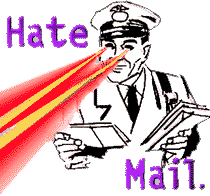 I do not term the e-mail hate speech because it presents a viewpoint "automatically different" from mine; I term it hate speech because it seeks, through misrepresentation, hyperbole, and distortion, to vilify an entire group based on religion. The piece has been picked up by other bloggers and by journalists who deem hate mail, though I don't need their concurrence to call it like I see it.